This is a once in a lifetime trip with everything you could want for your Vacation in Ireland! Your stay will include nights in the most luxurious Irish Castles and Manors on this 10 night luxury tour which also includes: A ferry trip to Inishmore, the largest of the Aran Islands and home to the spectacular pre-Christian Dun Aonghus Fort, Gourmet meals in some of Irelands most prestigious culinary locations, a private falconry experience and so much more. While this tour includes many of Ireland’s most iconic locations, it will also afford you the opportunity to experience something extra. 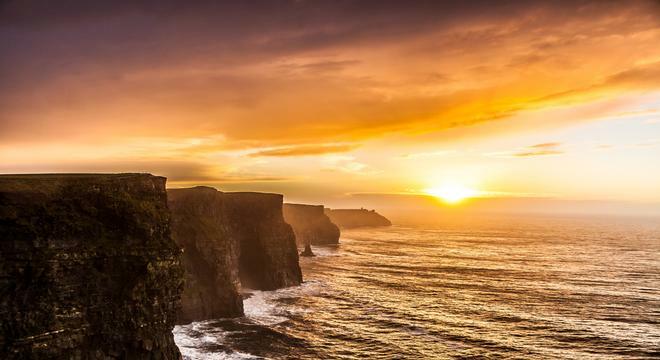 Due to the fact all of our travel consultants live in Ireland, they also have an intimate knowledge of Ireland’s hidden gems, sights and locations they will be more than happy to direct you to. We design all of our tours in-house with precision and a dedication to quality that is unmatched in the industry. To compliment your tour you will have your own dedicated travel consultant as well as the comprehensive daily sightseeing guide that will be provided for you. As well as the upgrades to 5 star hotels in all locations, additional highlights of the platinum tour while in Ireland will be 2 nights in the wonderful Dromoland Castle, attending the Bunratty Castle Banquet, afternoon tea in Dublin’s Deluxe Merrion Hotel, a Falconry session in Dromoland Castle plus so much more. To top it off, your tour price includes 3 gourmet dining experiences in 3 of Ireland’s premier restaurants, The Michelin Star restaurants of Patrick Guilbaud in The Merrion, The Earl of Thomond restaurant in Dromoland Castle and the Cliff House in Ardmore. Car rental (Automatic) for 9 days. Private chauffeur option available on request - including our special comfort pack complete with GPS, additional driver and super cover for peace of mind driving. Complimentary short riding session on the hotels Austrian Halflinger ponies around the hotel grounds.